The Landis Sewerage Authority’s operating practices exemplify a holistic approach to water resource management. The Authority partners extensively with community and environmental groups and its programs include many opportunities for public education. 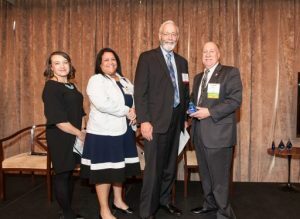 (L to R) Jennifer Brunton, One Water Awards Jury Chair; Nicole Wiley, chair of New Jersey section of the American Water Works Association and Rick Dovey, past president of the Association of Environmental Authorities of New Jersey present Dennis Palmer of the Landis Sewerage Authority with the New Jersey One Water Award at the Jersey Water Works Annual Conference. The inaugural New Jersey One Water Awards, sponsored jointly by Jersey Water Works, the Association of Environmental Authorities of New Jersey, and the New Jersey chapter of the American Water Works Association, were developed to honor initiatives that exemplify the principles of the One Water approach: the belief that all water- stormwater, drinking water, wastewater- has value that can be unlocked by implementing sustainable, inclusive, and integrated water resource management practices. Read the full profiles for the four winners of the 2017 One Water Awards. The Landis Sewerage Authority is a lot more than just a wastewater treatment plant. Its facility-wide programs handle water holistically, with the overarching goal of contributing to the health of the watershed. The result is a plant that operates more broadly as a resource reclamation facility, acting as a positive player within the larger ecosystem. The authority’s projects begin with water. Each year, the plant returns 1.8 billion gallons — the highest volume in New Jersey — of highly treated effluent to the ground. This strategy differs from most treatment plants, which usually release treated wastewater into rivers or the ocean, preventing a return to the original source. In contrast, LSA’s policy of applying the effluent to land via infiltration basins and spray irrigation helps recharge the aquifer. In turn, the aquifer supports the wetlands and base flow for the Maurice River. At the LSA, even byproducts have a use. The authority collects wastewater biosolids, which are rich in nitrogen and phosphorus, and uses them as organic fertilizer for the corn, hay, and straw grown on its 400-acre farm. Crop production has exceeded 1,100 tons per year, and gross sales of more than $100,000 per year help stabilize LSA’s user rates. 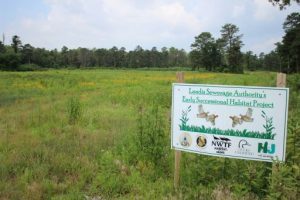 Biosolids are also used for fertilizer as part of LSA’s forest management plan: It used 150 of its 1,800 acres to plant 75,000 trees, including Eastern white cedar. The trees sequester carbon, removing greenhouse gases from the atmosphere. A sign marks a preserved habitat area at the Landis Sewerage Authority. Landis Sewerage Authority strives to provide habitats for the species that rely on its ecologically sensitive tract of land. Its efforts to maintain the watershed have contributed to a large, on-site population of swamp pink, an at-risk species that is rare elsewhere. In partnership with New Jersey Audubon, the National Wild Turkey Federation, New Jersey Fish and Game, New Jersey Forest Fire Fighting Service, New Jersey Outdoor Alliance, and South Jersey Quail Project, LSA has worked on habitat restoration project for bobwhite quails. The restored pine savannah habitat will also support other bird species and milkweed for Monarch butterflies. With Citizens United of Maurice River, LSA has created nesting boxes for bluebirds. Future projects include a focus on purple martin colonies and continuing conservation collaborations. On the renewable energy front, LSA hosts solar power in partnership with the Vineland Municipal Electric Utility. A waste receiving station collects food waste, fats, oils, and grease and processes them with an anaerobic digester. The digestion process produces methane, which is then run through a clean-burning engine to produce electricity and hot water. The authority also has an on-site wind turbine mounted on a 45-foot monopole. In 2017, the facility installed two electric car-charging stations that can charge cars using energy from the wind turbine on windy days. On the whole, LSA generates more energy than it consumes. The authority also recognizes the importance of getting the public excited about environmental efforts. It provides opportunities for various children’s groups, including Poultry Pride, N.J. Youth Corps, and 4H, to participate in habitat restoration. It has sponsored a middle school Earth Day poster contest in Vineland for the past 23 years; approximately 200 students participate each year. For college students, LSA hosts internship opportunities that provide real-world experience working at the facility. Its frequent plant tours reached an international audience in 2016, when the facility hosted several visitors from Africa through the Rutgers Mandela Washington Fellowship for Young African Leaders.